This is a user-friendly and comprehensive beginner Indonesian book and a great way to learn Indonesian. 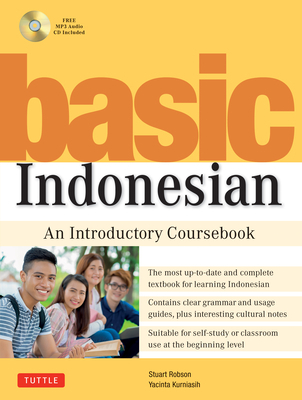 Divided into 28 graded lessons, Basic Indonesian provides fill-in-the-blank exercises, quizzes, word puzzles and question-and-answer practices to reinforce Indonesian language learning. Extensive cultural notes are provided along with detailed tips on etiquette and appropriate cultural behavior in the world's largest Islamic society. It has been made to fill the need for a one-volume Indonesian course book which can be used for either self-study or classroom use by those who are keen to make a start on mastering the Indonesian language. The users might be students in universities or schools outside Indonesia, or expatriates living in Indonesia. The stories are set in Jakarta (apart from an excursion to Yohyakarta), are original and describe realistic situations, contain some interesting cultural sidelights, and display a lively mix of narrative and dialogue. Chapters include clear Language notes, which, help explain the grammar and build a solid foundation for further steps forward in the study of Indonesian. The MP3 Audio-CD is to be used along with the book and reinforces pronunciation while building better listening comprehension. Multiple types of accompanying exercises. Entertaining stories and dialogues in manga-style cartoon strips. Clear grammar and usage notes. Stuart Robson was Associate Professor of Indonesian at Monash University from 1991 to 2001 and is currently an Adjunct Associate Professor there. Yacinta Kurniasih was born in Kedungjati in Central Java. She is at present a lecturer in Indonesian at Monash University in Melbourne.